TAP Portugal has unveiled plans to start serving Bogota and Panama City, providing important new links to two Star Alliance hubs. Bogota and Panama City are two of the largest hubs in Latin America but are relatively under-served from Europe. TAP will be the fourth carrier and first Star member to operate long-haul services from Panama City, which is the hub of Star member Copa Airlines. Bogota is now served by only four long-haul carriers, including Star members Avianca and Lufthansa. Bogota and Panama City, which will be served in a triangle routing from Jul-2014, are also strategically important for TAP as they will diversify its Latin America network. TAP is the fifth largest carrier in the Europe-Latin America market but currently 12 of its 13 Latin American destinations are in Brazil. TAP recently opened ticket sales for Bogota and Panama City, which will expand the carrier’s long-haul network from 16 to 18 destinations. TAP will operate from 1-Jul-2014 four weekly flights on a Lisbon-Bogota-Panama City routing with A330-200s. TAP currently uses its widebody fleet, which consists of 12 A330-200s and four A340-300s, to serve 12 destinations in Brazil, Caracas in Venezuela, Luanda in Angola, Maputo in Mozambique and New York (Newark) and Miami in the US. Bogota and Panama City will be the first destinations which are combined in a single flight. All 16 long-haul destinations are served from TAP's main hub of Lisbon but five are also served from Porto in northern Portugal and one from the Portuguese island of Madeira. TAP will not carry local passengers between Bogota and Panama City, a short one hour sector served with regular frequencies by the Avianca and Copa groups. The triangle routing is not ideal as it does not provide a non-stop product to either destination in both directions. But it allows TAP to test the markets with limited risk. If successful, TAP will likely de-couple the destinations and start operating separate non-stop flights to both destinations. Operating the flight with a stop in Bogota followed by Panama City also allows TAP to operate in both directions without any payload restrictions. Bogota’s high altitude often leads to restrictions on long-haul flights but TAP will not have this issue as it will only operate from Bogota to Panama City, which is at sea level. Both destinations will provide TAP with connections to a larger array of offline destinations in Latin America. Panama City is by far the largest hub for international connections within Latin America. Bogota is the sixth largest airport based on intra-Latin America international seat capacity and is the third largest based on total capacity (both domestic and international). Sao Paulo Guarulhos is the largest airport based on total seat capacity within Latin America and is the second largest based on international capacity within the region. TAP currently serves Guarulhos with 14 weekly flights, making it the carrier’s largest long-haul destination. 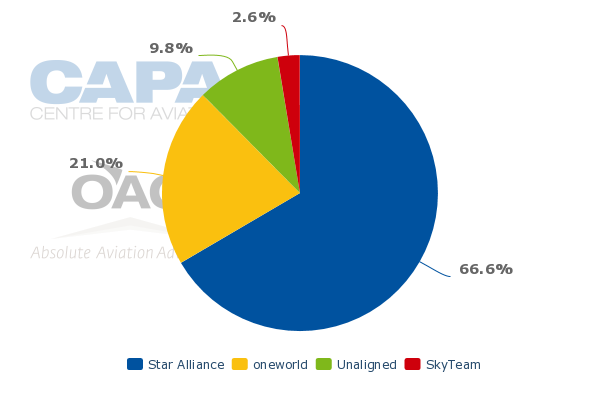 But international connections at Guarulhos will significantly reduce for TAP and other Star Alliance carriers in Mar-2014, when Brazil’s largest carrier TAM leaves Star for oneworld. Avianca Brazil will join Star by the end of 2014 and the alliance is also looking at adding Azul as a second Brazilian member. But Avianca Brazil and Azul are both domestic carriers. Access to secondary Brazilian cities via Guarulhos and its other Brazilian gateways are very important for TAP as domestic connections are critical for the carrier to maintain its status as the leading European carrier in Brazil. Avianca Holdings includes Colombia-based Avianca as well as subsidiaries in Central America, Ecuador and Peru. Should TAP end up in the same family of airlines as Avianca Brazil and Avianca, the Portuguese carrier would likely look to leverage synergies by expanding its Bogota service as well as potentially launch service to other Avianca hubs such as Lima. There would also be synergies with Avianca Brazil but these would be limited to domestic connections and supporting point of sales in Brazil. TAP also has been relying on TAM for offline access to international destinations. TAP will be able to regain all of the international connections that will be lost as TAM moves to oneworld – such as Asuncion, Buenos Aires, Lima, Montevideo and Santiago – via Panama City and in some cases also via Bogota. With Panama City and Bogota, TAP will also gain offline access to several new international destinations in northern South America and Central America which were previously not part of its network. Panama City is linked with over 50 destinations in Latin America and the Caribbean. All of these destinations are served by Copa, which has a dominating 85% share of seat capacity at Panama City. 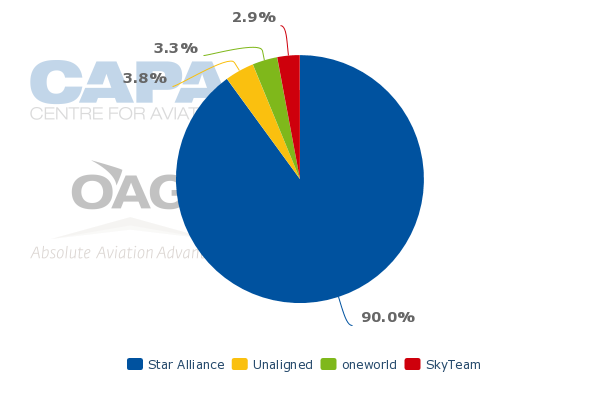 The Star Alliance has a 90% share of capacity at Panama City. It is somewhat surprising it has taken over three years since Star approved Copa as a new member for Panama to attract another Star carrier. Currently Avianca and United are the only Star carriers besides Copa that serve Panama. Panama City is an attractive and fast-growing hub for accessing other markets in Central America and portions of South America and the Caribbean. It is also a strong destination in its own right, with expansion of the Panama Canal and Panama City’s emergence as a regional financial centre driving increasing demand for business travel. Panama is one of Latin America’s smallest countries, with a population of less than 4 million. But it has one of the hottest economies in the region with GPD growth of almost 9% in 2012 and almost 11% in 2011. Growth of between 7% and 8% is expected for 2013. Latin America’s two largest economies, Brazil and Mexico, are expected to grow by only about 3%. While the country is small there is growing inbound demand for both business and leisure travel. The outbound market is also expanding as Panama’s middle class grows and discretionary incomes are on the rise. It is just a matter of time before Star carriers from outside the Americas start to leverage Star’s dominating position in Panama City. Panama’s strong economy and Copa’s strong hub should make it a no-brainer. Copa would like to see more Star carriers serve Panama as it has no intensions of expanding into widebody aircraft. It has had huge success, including some of the consistently highest profit margins in the global airline industry, by sticking to an all-narrowbody model. Copa has exploited the central location of Panama, which is virtually the only country that is within narrowbody range of the entire Americas region (barring isolated destinations such as Alaska and Hawaii). Bogota is linked with over 20 international destinations. This does not give Bogota the international connections of Panama City but it is connected to about 40 domestic destinations in Colombia. While Panama is purely an international market the domestic connections are important for Colombia, which has the fourth largest and one of the fastest growing economies in Latin America. Two Star members, Avianca and Copa Colombia, both operate domestically in Colombia. Copa Colombia also has a small international operation while Avianca and its subsidiaries account for over 50% of international capacity at Bogota. Star currently accounts for about two-thirds of total capacity at Bogota, making it an attractive hub for Star members outside Latin America. But United, Air Canada, Lufthansa and Copa are the only Star carriers outside the Avianca group which currently serve Bogota. Lufthansa became the third European and only European Star member serving Bogota in late 2010, when it launched services from Frankfurt. Air France and Iberia serve Bogota from Paris and Madrid respectively while Avianca’s European network consists of two destinations, Madrid and Barcelona. Like Panama, Colombia is a growing market in its own right that can potentially support more service from Europe. TAP serves over 40 destinations in Europe, giving it the ability to match Air France, Iberia and Lufthansa in offering one-stop connections to Bogota from throughout Europe. TAP is currently the fifth largest carrier in the Europe-Latin America market after Air France, Iberia, KLM and Air Europa. But nearly all its capacity is in the Europe-Brazil market, where it is the largest carrier. Its only other current destination in Latin America, Caracas, is an important and at times profitable local market but does not offer any connections. Latin America is an important market for TAP, accounting for almost 40% of the carrier’s ASKs. It is logical for TAP to continue to pursue expansion in the region, where demand remains relatively strong. While Brazil is by far the largest market in Latin America, the rate of economic growth in other Latin American countries such as Colombia and Panama if much faster, providing opportunities for TAP to diversify its Latin American network. TAP’s strong position in the growing Europe-Latin America market will again be a big draw as the Portuguese government resumes the privatisation process in early 2014.